While I knew there is a tramway museum in Zürich, it took many years for me to visit it. This Saturday we finally went. The museum is not very big, it basically occupies an old tram depot, but has a wide collection of old tramways, most of them in very good condition. There is also an inspection gallery which lets you look at the underside of one of the vehicles. Old parts and explanations about the city network and multiple play areas complete the exhibit. What I found interesting is that the current network grew out of a set of disjoint, private companies, in the same way the swiss railway network was the merger of multiple train companies. There is also a model of the Zürich subway project, which got killed in a popular vote, but whose already built tunnels were reused for the S4 and the S10 and the 7 tramway line (old post about this in french). What I found striking is how short the first two axles tramways were. 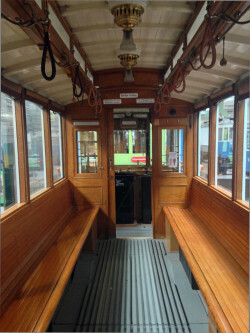 And while they were very pretty, with wooden benches and copper lamps, but they also contained many signs asking people not to spit on the floor, and giving exact pricing for breaking various part of the tramway. I also learnt that the Forchbahn used some old carriages from the tramway company in Lausanne. The last tramways ran in Lausanne in 1964. All in all I nice small museum to visit on raining week-end. This entry was posted in English, Exposition, General, Languages, Zürich and tagged Public transport, Tramway. Hello, re: Züri Tram I remember taking the tram with Brigitte Frey (her maiden name) in a “Chischte”, the van that didn’t have doors that closed, so that you could jump onto the platform, when the tram was already leaving the station. You ran the risk of being shouted at, that was all. While searchig for Tram museum topic. I found your blog. This is really helpfull . I also writtne about the same topic “Kolkata tram museum Smaranika & Victoria | Heritage ac cafe restaurant”. Please have a look. Waiting for your opinion. Happy to follow.